WALNUTS & KALE LOVE ME–AND YOU TOO! I love walnuts! Walnuts and I are great friends who enjoy each other’s company often in a multitude of delicious ways. I also love kale, and I know I’m certainly not alone–lots of people love kale. Turns out both walnuts and kale love people, too! Those rich and crunchy nuts and dark, chewy, greens are packed with antioxidants–lots of antioxidants. Don’t’ ever worry about getting too many antioxidants. It’s practically impossible to do. In fact, most people don’t eat enough of them and suffer health challenges. To reap walnuts’ and kale’s wonderful antioxidant benefits, pair them up, and turn them into a fabulous salad! Deliciously nutty and oh! so tasty, this salad is a winning combination of fresh flavors, pleasing textures, and a healthful nutrition boost. A very tasty, delicately sweet Zesty Cilantro Dressing tames the somewhat bitter bite that makes walnuts and kale off-putting to some. The bonus surprise is that this salad is an excellent keeper and tastes just as fresh and charismatic next day. 1. Wash the kale thoroughly and cut or tear away the tough center rib. Tear the kale into bite size pieces, discarding any smaller tough ribs will that make the salad difficult to chew. 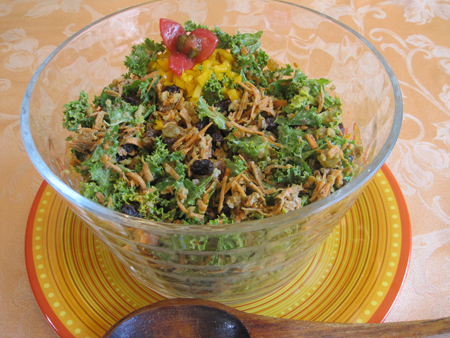 Place the kale pieces into a large bowl. 2. Pour the Zesty Cilantro Dressing over the kale pieces and use your hands to mix and massage the dressing into the leaves, coating completely. 3. Add the carrots, walnuts, and raisins and toss well to distribute all the ingredients evenly. 1. Combine all the ingredients in the blender and blend at high speed until they are fully pureed and the dressing becomes smooth and creamy. 2. Use a funnel to pour the dressing into a narrow-neck bottle for easy serving. Use immediately or chill and use later. Shake well before serving. Refrigerated, the dressing will keep for 1 week. Makes about 2 cups. CASHEWS ARE IN–MAYO IS OUT! Potato salad is THE VENERABLE KING at summertime picnics, potlucks, and barbecues. Recently, though, I’ve noticed people take a pass on this old-time favorite, often saying something like, “Oh, I rarely eat potato salad–it’s not very healthy.” How sad for that wonderful bowl of delicious potato salad that can be transformed into a highly nutritious salad. Sidestep the mayo, trade it for a highly nutritious cashew sauce instead, and you can still enjoy a delicious serving of potato salad at the barbecue. 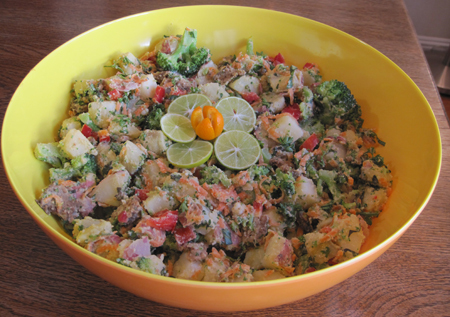 — Especially a potato salad enhanced with sweet potatoes, broccoli, fresh herbs, and a touch of vegan bacon. In an effort to lose the mayo, I devised an inventive substitute that’s actually good for you. I just whipped up a combination of raw cashews and water in the blender until the mixture became a smooth and creamy sauce. Then, I slathered it on my yummy potato salad and tossed it all together. It’s really easy. You, too, can cashew up and savor every succulent bite of your awesome picnic or potluck treat. What makes my cashew sauce more nutritious than mayonnaise? I actually made a comparison of the ingredients in mayo with those of the cashew sauce. It was a no-brainer–the cashew sauce came out on top, really. Here’s the deal. Mayonnaise is composed mainly of vegetable oil, thickened with egg yolk, and flavored with a touch of lemon juice and salt. Vegetable oil has no protein, no fiber, no minerals, and no vitamins except for vitamin E. Other than Vitamin E, vegetable oil has no antioxidants, either. Vegetable oil is 100% fat. What it does contain is plenty of calories and fat. How about 120 calories and 14 grams of fat for every tablespoon! Yikes! Mayo’s egg yolk content adds yet another health concern. If it weren’t for the 215 mg of cholesterol in each egg yolk, eggs might be healthful. But that 215 mg of cholesterol presents a challenge for those who struggle with high cholesterol. Here comes the good part. Because they are plant-based, cashews contain zero cholesterol and are packed with protein and fiber. In addition, cashews are a storehouse of minerals including calcium, copper, iron, magnesium, manganese, potassium, selenium, and zinc. Cashews offer healthy doses of vitamins B1, B2, B3, B5, and B6 in addition to high levels of folate, an important member of the B vitamin family that prevents neural tube defects in pregnant women. Because I’m always blogging about the awesome antioxidant levels in nuts, I’m delighted to mention that cashews enjoy their share of antioxidants. Cashews are blessed with a variety of antioxidants from the vitamin E family like beta tocopherol, gama, and delta tocopherol. They also have a good measure of lutein and zeaxanthin, antioxidants that help lower the risk of heart disease. The inner portion of your arteries and blood vessels has a one-cell-thick lining called the endothelium. When you consume foods like nuts that contain L-arginine, the endothelium goes to work manufacturing and releasing nitric oxide. That’s the stuff that relaxes the arteries, allows them to dilate, and provides steady, uninhibited blood flow to and from the heart. I hope I’ve lured you into at least trying a hearty serving of Cashew Kissed Potato Salad. Besides tasting ultra delicious and looking gorgeous, it’s actually good for you. A simple, yet rich cashew sauce gives this potato salad its deliciously light coating and offers a pleasant diversity from the familiar mayonnaise base. When you need to bring more greens into the family meal, consider adding them to favorite dishes you know your family will enjoy. Broccoli and fresh herbs turn this summertime salad into a winning side dish, yet offer a chic, elegant, and irresistible way to boost nutrition. Choose some old favorites, splash them with a dusting of creativity and plenty of colorful veggies, and you’ll come to the table with an extraordinary new dish. That’s exactly what I’ve done with this recipe for a simple potato salad that sparkles with flavor and nuance. To make the potato salad super creamy, increase the cashew and water measurement to 3/4 cup each or simply double the amount to 1 cup each. 1. Place the White or Red Rose potatoes and the sweet potatoes into separate 2 to 3-quart saucepans and cover the potatoes with water. Cover the two pans and bring to a boil over high heat. Reduce the heat to medium and simmer for 4 to 5 minutes, or just until fork tender. Immediately, drain the water from each pan and add 2 tablespoons of the apple cider vinegar to each pan. Toss well to coat the potatoes, pour out the excess vinegar, and transfer both the white and sweet potatoes to a large bowl. 2. Rinse one of the saucepans briefly, fill it 2/3 full with water, cover, and bring to a boil over high heat. In batches, blanch the broccoli for 1 1/2 minutes, or until just fork tender, but still firm. Use a slotted spoon to remove the florets to a dish to cool. Drain any excess liquid and add the blanched broccoli to the bowl with the potatoes. 3. Add the carrot, Fakin’ Bacon, parsley, mint, basil, salt, and pepper. 4. Combine the cashews and water in the blender and blend on high speed until smooth and creamy. Add the cashew sauce to the potatoes and mix gently with a wooden spoon to coat all the ingredients. Adjust seasonings, if needed, and enjoy immediately or chill and serve later.